Based on over a decade of data center relocation, migration and consolidation experience, TDS has created TDS TransitionManager, the industry’s premier data center migration solution. TDS TransitionManager was built specifically to implement a complete set of best practices for planning and managing all aspects of both physical and virtual data center migrations. By providing all parties with real-time visibility into all relocation activities, TDS TransitionManager improves communications and collaboration across the team and accelerates migrations while also reducing the risk of unplanned outages. 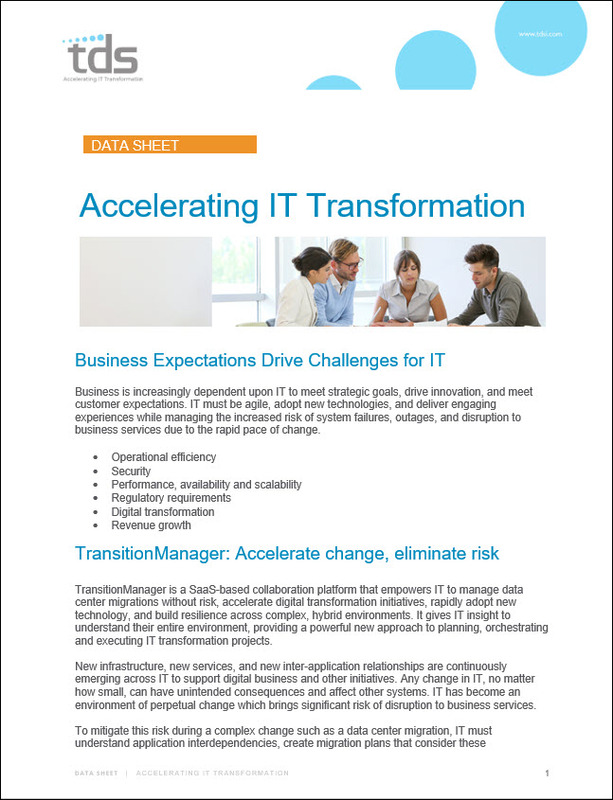 In our experience, we see a few common obstacles that are standing in the way for an IT team manager when they are confronted with the challenges of IT transformation projects. Choosing a new colocation facility can be a daunting task for even the most well-informed buyer. For years, Transitional Data Services has helped clients across North America, Europe and Asia select optimal facilities, and confirm the facility’s use of industry best practices. Our principal partnership team includes former data center owners who have direct experience building, operating, and selling co-location space to customers just like you. Additionally, with years of data center assessment/design/build experience, the team at TDS will assist you in critical infrastructure inspections of potential sites…. Today’s data center has evolved beyond its roots as a “traditional enterprise data center” — it is substantially more diverse and fluid than its previous incarnation. The core of this fluidity springs from data center managers embracing the concept of a “virtual” data center: in essence, a pool of physical and virtual resources that can be scaled as needed. The flexibility of a virtual data center allows its managers to tailor departmental infrastructure for increased responsiveness for their internal and external clients’ needs.